I'm starting to realize that a lot of the vintage dresses I'm attracted to were originally intended to be house dresses. 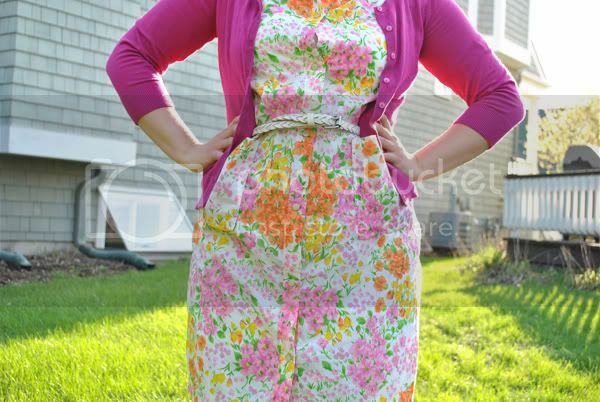 This dress is no exception, it's most definitely a vintage (probably homemade) house dress. But I'm a little bit in love with it, and it's now a dress I wear to look put together! I like that it has a new life :) I'm really into these gray tights right now, but this is a cheapo pair from Target that I'd like to replace with a nice pair (maybe from We Love Colors!). And my shoes... My dear little Sangos. These shoes have been worn just about every day since I got them in the mail. 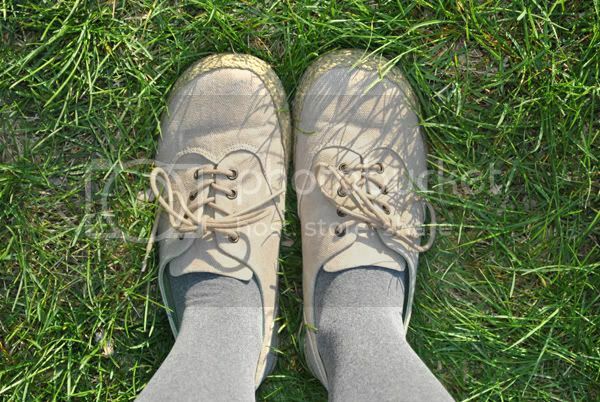 They're perfectly springy, and super comfortable. I fall more and more in love with them everyday! I wore this outfit to go out to a bar/restaurant and it was the first time in a few weeks that I wore a dress out! One of Chris's best friends is in town and we've gotten together with some other friends from high school to reconnect and reminisce. It's been tons of fun, and I'm happy to have had the opportunity to hang out with these people. It's such a cliché, but it's so bizarre seeing old friends and realizing that we're all growing up and becoming adults... I'm constantly surprised by it! I put my lip ring back in, and I've ordered new jewelry that will hopefully solve my issues (thanks, Katie, for the eBay tip!). I just don't feel the same without it, and Chris certainly missed it! Also, please don't judge my roots, I need to dye my hair really bad. The problem with my natural hair color is that when it starts to grow in, it's so ashy that compared to my dyed black hair, it looks green! It doesn't show that bad in these pictures, but in person.... Oof. i love the bright colors :) so happy and spring-y!! I've carried my love of gray tights into spring & am loving it. Looking good gal! Love the dress! I wish I were that cute :) Your hair looks good! If I saw you on the street and I was in a bad mood, your outfit would definitely lift my spirits. oh dang i LOVE that dress! the print is soooo goooood! i LOVE this dress. the floral print is fantastic. 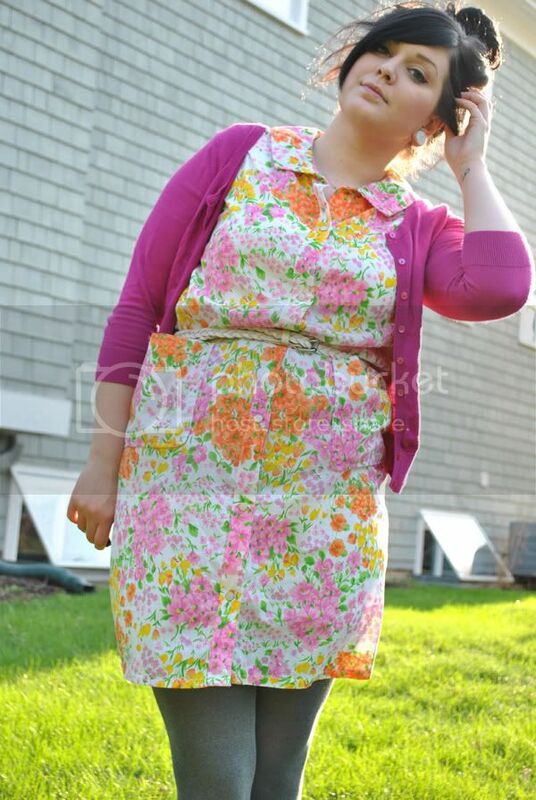 i have the same attraction to house dresses, but had to give them up after several complaints from my boyfriend and mom... they can be unflattering on me if they're shaped too much like a muumuu. love this one though. You look LOVELY! 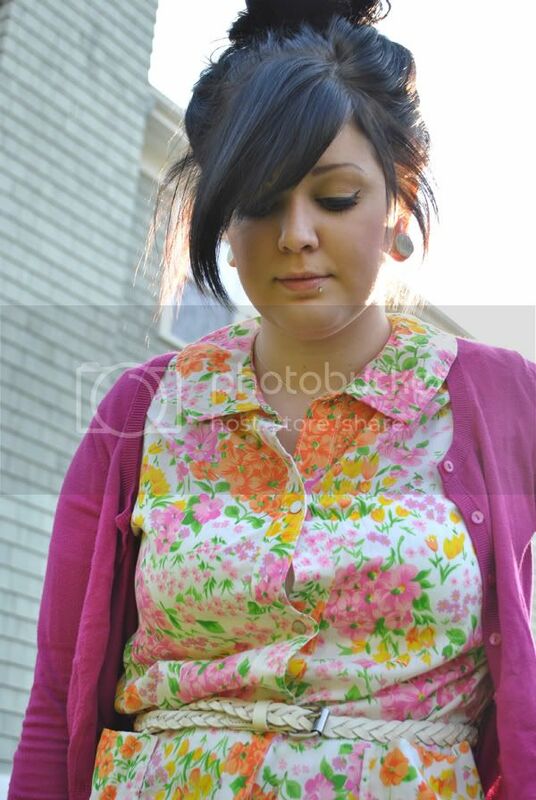 I love bright vintage florals, girl. :) I am liking all of these outfit posts. Gorgeous. 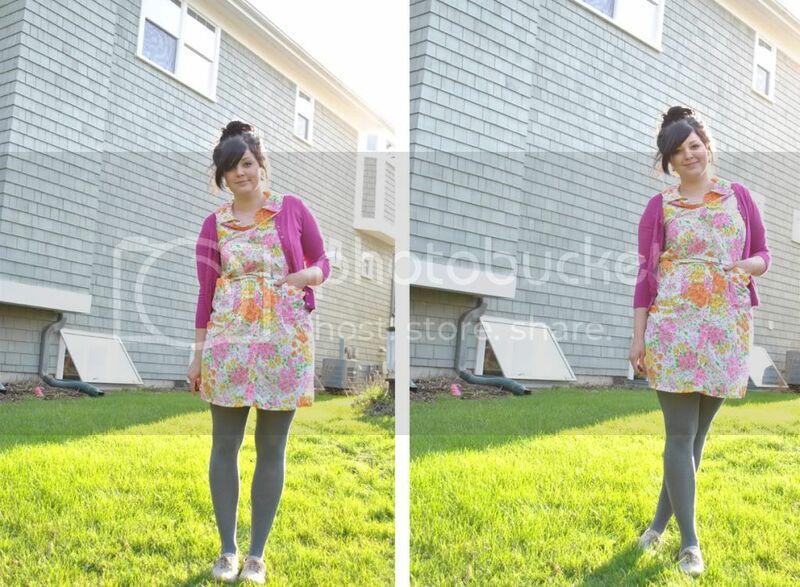 these pic are amazing, I adore your dress, how you styled it AND those super cute shoes! What a great dress, so wonderfully colorful! It totally reminds me of Easter/Spring! The colours in this dress are my current favourite combination. So pretty! Also, I feel your pain with the roots thing. When my hair was briefly black my roots looked bonkers!! I love this dress, what an amazing thrifting score! The colors are so perfect for spring and I love how the style can be worn in so many ways. You look great! i love the bright colors :) so pretty!